The global scleroderma diagnostics and therapeutics market is fairly fragmented with the presence of several small and medium-sized pharmaceutical companies competing against each other and with large players, notes Transparency Market Research (TMR). Prominent players vying for a significant share in this market are Actelion Pharmaceuticals, Inc., Boehringer Ingelheim, Bayer AG, Corbus Pharmaceutical Holdings Inc., Cytori Therapeutics, Inc., Cumberland Pharmaceuticals, Inc., Pfizer, Inc., Sanofi, and Gilead Sciences, Inc.
Few global pharmaceutical companies have therapeutic products in different phases of clinical trials which are useful for finding effective treatment of systemic sclerosis symptoms. With the presence of few players, this segment is niche and is marked by moderate competition and low entry barrier. Several players are actively undertaking strategically motivated collaborations and expanding their presence across various geographic regions to consolidate their market shares. According to estimations by TMR, the global scleroderma diagnostics and therapeutics market is expected to expand at 9.7% CAGR during 2016 - 2024; the global market stood at US$1,633.5 mn in 2015 and anticipated to reach a valuation of US$3,663.7 mn by the end of forecast period. Based on the drug type, the scleroderma diagnostics and therapeutics market is segmented into corticosteroids, endothelin receptor agonists, immunosuppressive agents, calcium channel blockers, prostacyclin analogues, chelating agents, H2 blockers, proton pump inhibitors, ACE inhibitors, and PDE-5 inhibitors. Of these, immunosuppressive agents or drugs are gaining increased acceptance among patients and physicians since they are found effective to treat a variety of symptoms in patients suffering from systemic as well as localized scleroderma cases. The therapies, including the cancer drugs cyclophosphamide and methotrexate, are efficacious in treating inflammatory symptoms of scleroderma, stimulating the demand for these drugs. High frequency of usage of immunosuppressive agents among patients in major regions is expected to propel the market. Based on geography, the global scleroderma diagnostics and therapeutics market is segmented into North America, Europe, Asia Pacific, Latin America, and the Middle East and Africa. Of these, North America contributed a major market share in 2015. The regional market is anticipated to rise at a CAGR of 11.2% during 2016–2024. The growth of the regional market is due to the presence of numerous global pharmaceutical companies, institutes and research organizations. They are making intensive efforts to find a viable cure for scleroderma. In addition, a large number of cutting-edge researches related to novel therapies for orphan diseases is expected to boost the regional market. 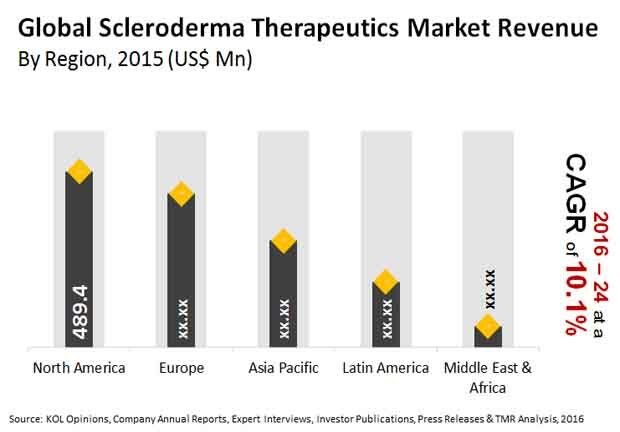 The scleroderma diagnostics and therapeutics market is primarily driven by increasing clinical trials for treating systemic sclerosis, intensive researches carried out in developed regions, and the acceptance of new therapies. The rise in approvals for therapies for scleroderma-related pulmonary arterial hypertension is a key development expected to fuel the market. The disease is one of the most common complications of systemic sclerosis and forms the leading causes of mortality in the patients. The premium pricing of the orphan drugs and the high cost of development of these drugs have impeded the growth of the market in various regions, particularly in price-sensitive ones. The presence of large unmet medical needs in various regions, especially in developing markets, has created exciting opportunities for several players to capitalize on. Furthermore, the rise in disposable incomes in various countries in Europe and North America, coupled with favorable reimbursement policies, is expected propelled the demand for scleroderma diagnostics and therapeutics. The study presented here is based on a report by Transparency Market Research (TMR) titled "Scleroderma Diagnostics and Therapeutics Market (Drug Class - Corticosteroids, Immunosuppressive Agents, Endothelin Receptor Agonists, Calcium Channel Blockers, PDE-5 Inhibitors, Chelating Agents, Prostacyclin Analogues, H2 Blockers, Proton Pump Inhibitors, and ACE Inhibitors; Indication - Localized and Systemic; Diagnostic Test Type - Skin Biopsy, Imaging Techniques, Blood Test, Electrocardiogram and Echocardiogram, and Pulmonary Function Tests) - Global Industry Analysis, Size, Share, Growth, Trends, and Forecast 2016 - 2024"